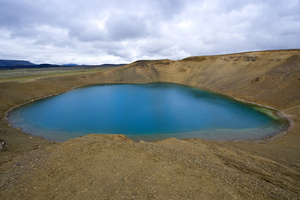 5-day Iceland Adventure Tour with horse riding and glacier hike. 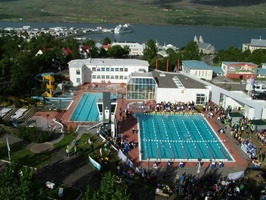 You arrive in Iceland and will have a private transfer from the Keflavík airport to your Hotel in Reykjavík. Overnight in Reykjavik. This 9-hour sightseeing program starts with a Viking Horse tour. The Icelandic horse is a breed that has remained virtually unchanged since the Vikings brought it to Iceland in the 9th century. 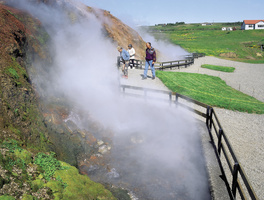 Enjoy a riding tour in the idyllic landscape of Laxnes, located just located in outskirts of Reykjavik city. The riding tour is suitable for all ages and experience levels, from beginner to expert. 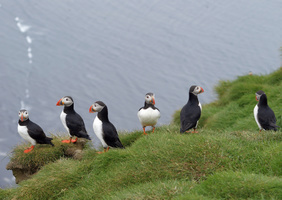 Our two-day tour starts by driving along the beautiful south shore of Iceland, which is home to so many pearls of nature. Expect to encounter breathtaking waterfalls, vast lava fields, glacier lagoons & black sand beaches, to name a few. Our first stop is at Seljalandsfoss, a very photogenic waterfall that plunges from ancient sea cliffs down over 60 m to a shallow pool. It is possible to take a walk behind the waterfall and enjoy the beautiful scenery from there. The water comes from the infamous volcano and glacier Eyjafjallajökull. 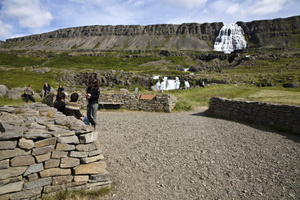 Our next stop will be at Skogar where we will see the Skogafoss Waterfall. It's also 60 m in height and is considered by many to be one of the most beautiful waterfalls in Iceland. Make note of another secret keeper: Myrdalsjokull Glacier is hiding Katla. She's a very explosive and active volcano. Our next stop will be at the village of Vik where you will find a black sand beach with some fantastic sights such as the picturesque basalt column formations and the magnificent Reynisdrangar sea stacks. Are you interested in geology? Pay attention to your guide when he / she starts speaking of "Jökulhlaup" and you see enormous devastated areas of sandy plains and ash. 'Cause not all effects of glaciation take place over thousands of years. When our volcanoes erupt under a glacier, they might destroy an ice dam or release massive volumes of melt water by heat alone, causing a devastating flood, a Jökulhlaup. 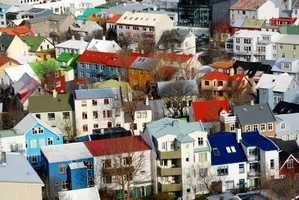 The term is Icelandic and has been adopted by the English language. The longest bridge in Iceland (900 m) is over one of those areas of glacial floods. 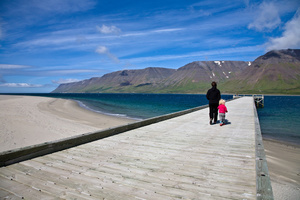 After that we go to Skaftafell area in the Vatnajokull National Park, where we'll have a short stop. The glacier tongues there give the national park a majestic fairy tale scenery. Jokulsarlon has been the film location of many Hollywood movies. It is located at the end of an outlet glacier of the great Vatnajokull Glacier. Huge pieces of ice calve from the glacier and end up floating in the lagoon and out to sea. After we have enjoyed the lagoon with its icebergs we will drive to our accommodation at one of the Country Hotels in South Iceland. Today you will get to get to know the glacier lagoon even better, before heading out onto the glacier, to experience the ever-changing icescape of the Svinafellsjokull. not frozen water, as some might think. But how does it turn into ice then? Simply by compression due to the weight of the snow as it keeps accumulating. It's just like taking a handful of fluffy snow and squeezing into a hard snowball, and keep doing so for hundreds of years. The ice eventually gets so compact that most of the air is forced out of it. This is the reason why glacial ice alone can have that fascinating crystal blue color - and the older the ice, the better. We pull out the crampons for one-hour long glacier hike in the Skaftafell area - enjoying fabulous views all the way. In order to join the glacier, hike you will need to have good hiking shoes. The crampons cannot be fitted onto sneakers or other light walking shoes. At locations where the glacier flows more rapidly, giant cracks called crevasses are formed. So, this is why it would be so dangerous to walk on a glacier without a specialized tour guide - the crevasses can get covered over by snow.